Hi everyone! I'm busy packing but wanted to stop in and do one last post before I leave for Leadership. This is one of my swaps I did for leadership. It features a new single image stamp Elegant Thank You and of course the ever popular, Upsy Daisy. One announcement about the new catalog there will be a selection of single image stamps available. 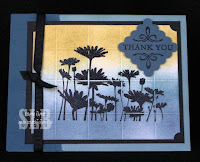 Something new for Stampin' Up! This card is done with the grid card technique. I'll be checking in from Orlando tomorrow! I love the grid technique used with this stamp set. Lovely! I love this card, the grid technique is perfect for this set. Have fun in Orlando, talk to you soon.